« Freddy and Jason help me bring the blog back to life. Go ahead and say it. “I thought you were going to start writing again. That was what, June?” Yeah well, whatever. I could spend my opening paragraph with some rambling apology/explanation, but I can’t be bothered. I’m hardly the first person who’s reading this who’s had a lapse in blog writing. So, we’ll just chalk this up to “I’ve been busy and here’s a bunch of words that happened in order: Halloween. Birthday. Vinyl Haul. Election. There’s not too much to say here that’s different from other punkin posts in the past, and that’s mostly because when my cousin and I get together to do this every year, we have the same ritual. We usually go to Wal-Mart, pick them out and then go back to his garage, where we slice them up, light them and take pictures. Meanwhile, he puts on some Halloween sound effects CD to play in the background. Same damn ritual every damn year. But if it ain’t broke, don’t fix it. But this year, we did do something else that night. We went to 2 different haunted houses in town. I kind of wish I had taken some pictures to share with you now, but both places were pretty strict about that kind of thing. The first one was called Nightmare on Pendleton and was pretty solid! It was a former funeral home and they took advantage of every bit of real estate they had. For $13 you could just tour the house, but for an extra $3, you could go through the maze outside. We opted for the full tour and it was great. The maze didn’t last long, but it was packed with all kinds of nice shocks and it’s always fun getting chased out of something by a guy waving a chainsaw. I used to work in a haunted house myself for 6 years, and chainsaws are a must. I think my old house had at least 4 rooms in which a chainsaw was involved somehow. Inside the house, you go into a “haunted elevator” which is basically a box hooked up to some kind hydraulics and flashing lights that simulated that it was rocking back and forth while moving up and down. It was actually a pretty believable effect. But the best feature of the entire thing was the body chute. You made your way upstairs and then straight-up SLID DOWN A SLIDE THAT WAS ONCE USED TO TRANSPORT BODIES FROM UPSTAIRS TO DOWNSTAIRS. Yes, you read that right, and it was a blast. And I don’t think I’ve ever slid down a slide that fast before. I mean, I was flying, and was greeted at the bottom with, you guessed it…guy with a chainsaw. It shocked me so strongly and was so abrupt that I actually turned around and started climbing back up the slide for a second! So yeah, Nightmare on Pendleton gets 2 bloody thumbs-up from me. And that’s saying something, because speaking as someone who made rooms and scared people every halloween for 6 years straight in a house that was once voted as being the scariest one in the midlands, I know my stuff and I am very critical. The second house, not so much. It wasn’t terrible, but it was worth the ticket price, especially since after taking advantage of the Groupon that I found, I basically got in for half price. The line for it was long and cold and packed with annoying teenagers, but they gave it their best effort with what they had. It’s hard to follow up the act of sliding down a corpse chute, but it was good fun anyway, and they gave out free candy, which I suppose is always a plus. But, that’s not what you came here for. 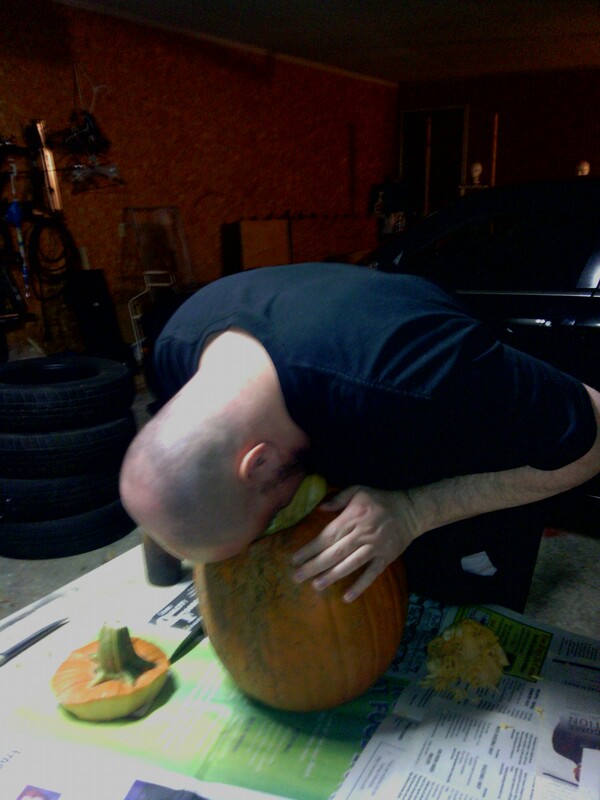 Here’s a picture tour of what went down with Punkin 2012. First off, the obligatory pre-carving pic. Wal-Mart had 2 bins to choose from–the $3.98 ones and the $7.98 ones. I got this out of the $3.98 bin and it was every bit as big as the ones in the $7.98 bin. Here’s a shot of what I like to refer to as the pumpkin gore. She never stood a chance. This is my cousin Larry’s. He went with a Two-Face kind of theme. You’ll see that on the right, it’s a traditional triangle-eyed, square-toothed kind of deal, but on the left, everything’s all jagged and scary. 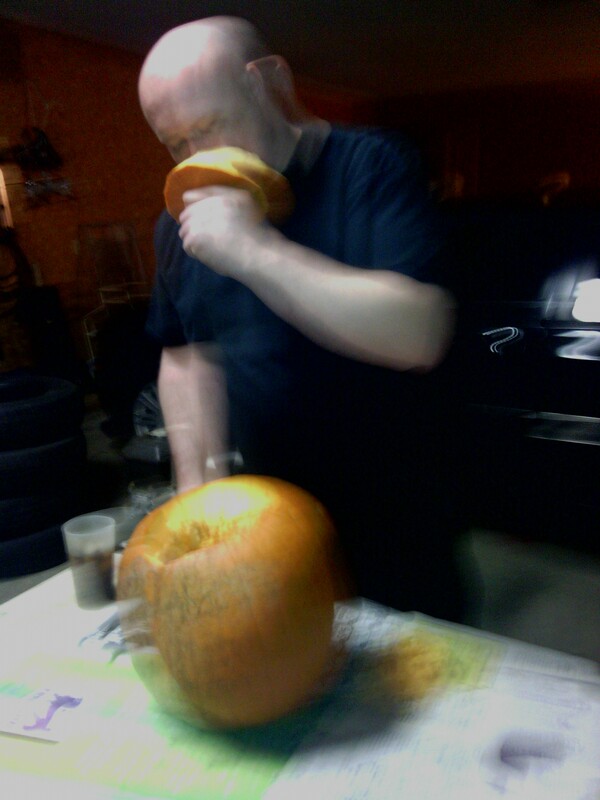 Larry really likes the smell of pumpkin…I mean, really likes it. I’m pretty sure we’re going to have to check him in somewhere and get him some help. 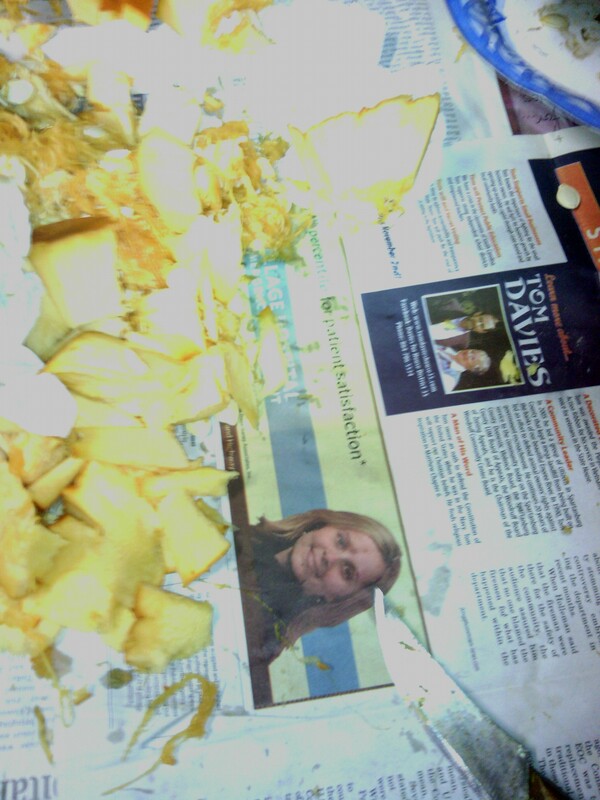 This entry was posted on November 8, 2012 at 10:47 pm and is filed under Uncategorized. You can follow any responses to this entry through the RSS 2.0 feed. You can leave a response, or trackback from your own site. Nice job Deej! I took a picture of mine, but didn’t get time to post it on Halloween. I guess better late than never? 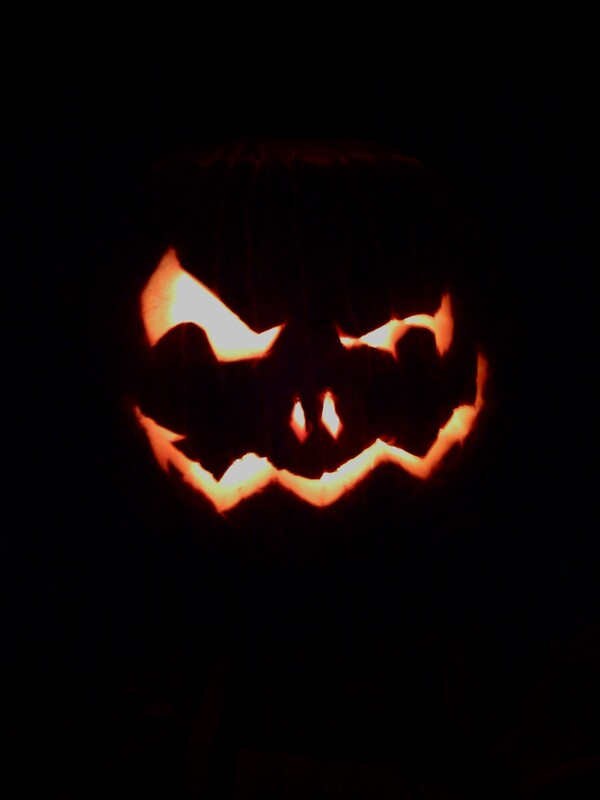 I went with a jagged teeth motif this year as well. Maybe I’ll post it just for the hell of it. And I don’t think I’ve ever seen anyone like the smell of pumpkin so much! Good thing you have pictures to prove it! Thanks. Yeah, he’s a punkin’ loving fool. Every year, we pull the seeds out and put them on a paper plate and he says he’s going to roast them or plant them or something, and every year he never gets around to it. 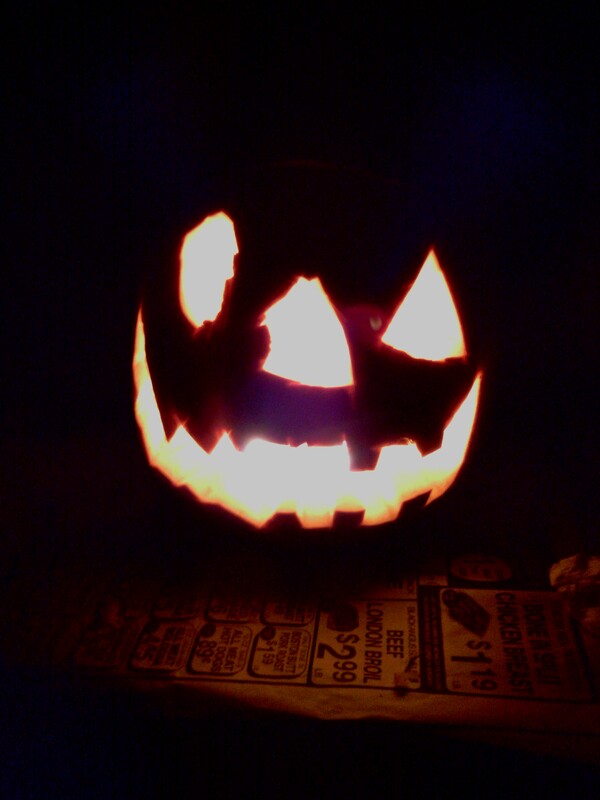 In fact, he looked over as we were carving and found the paper plate sitting on the shelf in the garage from last year. 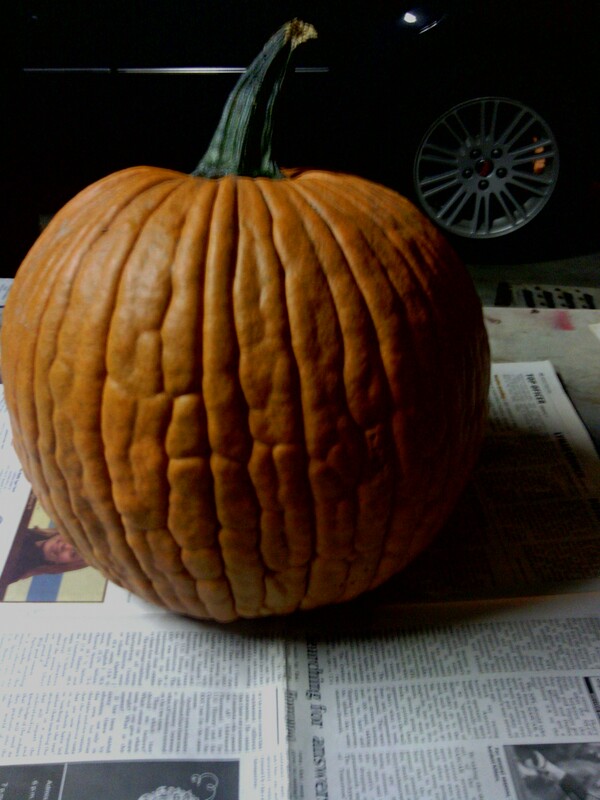 Still sitting there from when we carved pumpkins then. 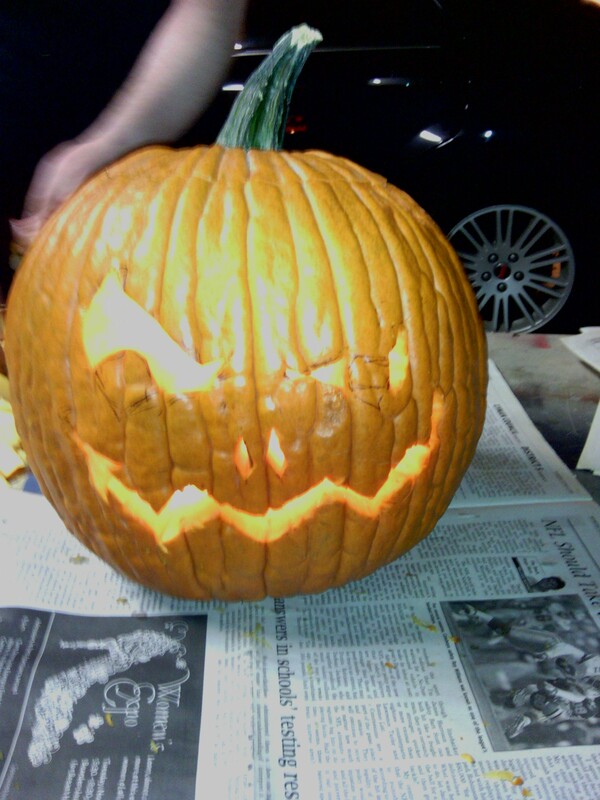 My pumpkin this year was straight off a template that came with the carving saws. A kitty for Sammy. Rob strayed from the demonic and carved Brobee from Yo Gabba Gabba for Sammy. I just Googled “Brobee” to see what he looked like. Looks like that would have been a lot of fun. How did it turn out?